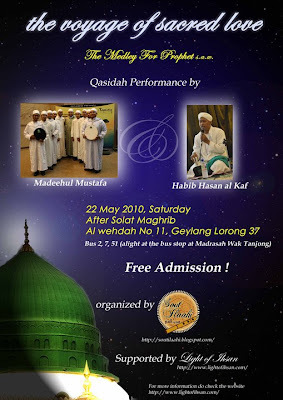 Voyage Of The Sacred Love : "The Medley For The Prophet ﷺ"
"The Voyage of Sacred Love: "The Medley for Prophet صلى الله عليه وآله وسلم" is a night of sacred Music, uplifting poetry and divine words that will draw you close to the man who forgave his enemies and came as a mercy to humanity. Listen to the enchanting voices singing the praises of ALLAH and the Prophet صلى الله عليه وآله وسلم and open your hearts to the spiritual music. Embark on a journey with Madeehul Mustafa, Habib Hasan Alkaf and Shaykh Imamudeen. Madeehul Mustafa is a qasidah ensemble consisting of local students studying in Damascus, Syria. Formed in 2002, they have been performing at various events. Recently, they performed to a crowd of over 2000 at the Esplanade, receiving rave reviews. Habib Hasan al Kaf حفظه الله تعالى from Solo became a munsyid at the age of 15. He studied in Darul Mustafa in 1996, and often recited the Qasidah Burdah at a Hadhramaut radio station when he was there. His captivating voice has inspired many and continues to inspire love and longing in the hearts of the seekers. Shaykh Imaduddeen حفظه الله تعالى is orginally from Jordon and lived in Boston for 18 years. 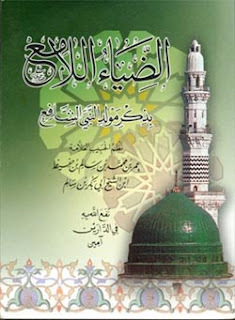 He has several ijazas from well-known scholars in Qur'an, Hadith and Fiqh. He is currently based in Tarim, Yemen with his Shaykh Habib Umar bin Hafidh حفظه الله تعالى.